An Atlas Orthogonist is trained in the structure, function, and biomechanics of the upper cervical spine. The Atlas Orthogonist is a fully accredited, Board Certified and licensed Doctor of Chiropractic. In 1970, Dr. Roy W. Sweat, D.C. B.C.A.O. designed a chiropractic adjustment instrument called the Atlas Orthogonal Instrument. He has since created a series of six different models. 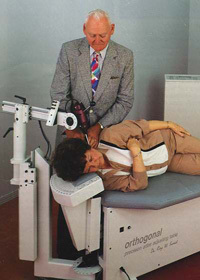 The instrument allows a doctor trained in Sweat-Atlas Orthogonal Technique to adjust an atlas misalignment with a very high degree of precision, while applying minimal physical pressure. This unique feature eliminates most patient discomfort during treatment. Dr. Sweat’s precision instrument was created to deliver nearly flawless chiropractic adjustment based on the specific misalignment findings from x-rays. A doctor of chiropractic trained in Sweat-Atlas Orthogonal Technique will take 3 x-rays of the spine in the cervical and upper-cervical area to determine their exact relationship. In proper position, the atlas will be orthogonal, or perpendicular, relative to the center of the skull, ie: in the center of the lower cervical spine both in the frontal plane, and the center of the skull in the horizontal plane. The Sweat-Atlas Orthogonal Technique has been added to the curriculum of many higher-learning institutions of chiropractic. 6. Myovision: Surface Electromyography (SEMG) is the measure of muscle tension. When there is a problem with your spine, or “subluxation”, the muscles respond to this nerve interference by tensing and bracing to compensate for the problem. 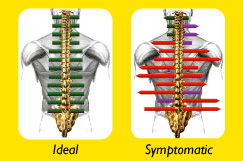 By measuring the differences in muscle tension from one side of the spine to the other, Chiropractors can identify problem areas. Once a problem has been discovered, periodic re-exams can track your progress towards more normal function. Myovision exams are quick and painless, and they can help Dr. Matsuno target specific areas for treatment!